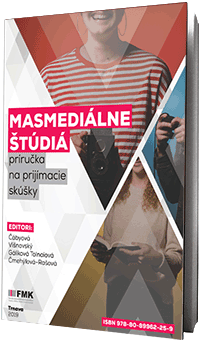 7th Edition of European Symposium on Religious Art Restoration and Conservation will be held by Faculty of Mass Media Communication. The symposium is scheduled to 4th – 6th June 2015 in Trnava. The religious art is part of cultural and spiritual heritage, and its preservation for the further generations, involving a wide multidisciplinary approaches. The interaction between tangible and intangible aspects of the religious art has recently been bringing together, thanks to plenty of interdisciplinary studies. Specialists in History, Theology, Arts, Conservation sciences, in marketing and mass media communication will add some knowledge and enhance the overall and intrinsic heritage values of this kind. The symposium will be held in Trnava, at the Marianeum, Archbishop’s Palace, located in 10 Via J. Holleho, 917 01 Trnava, Slovakia. Arrival of participants. Individual program. VISIT – „KATARÍNKA“ (ruins of monastery and church from 17th century) – 35 people. All participants are invited to submit their contribution before 10th May, 2015 (max 4 pages) specifying the session in which the paper is addressed to. The contribution must be original and must have not been previously presented to any other meeting or submitted for publication. Only accepted contributions of the authors, who have paid their registration fees till 18th May, 2015 will be scheduled for presentation. Selected articles will be published in a scientific journal European Journal of Science and Theology which is indexed in SCOPUS database and in ERIH PLUS as well. The contributions will be send by e-mail to esrarc2015(at)fmk.sk till 10th May, 2015.The authors will receive a confirmation after the manuscript submission. 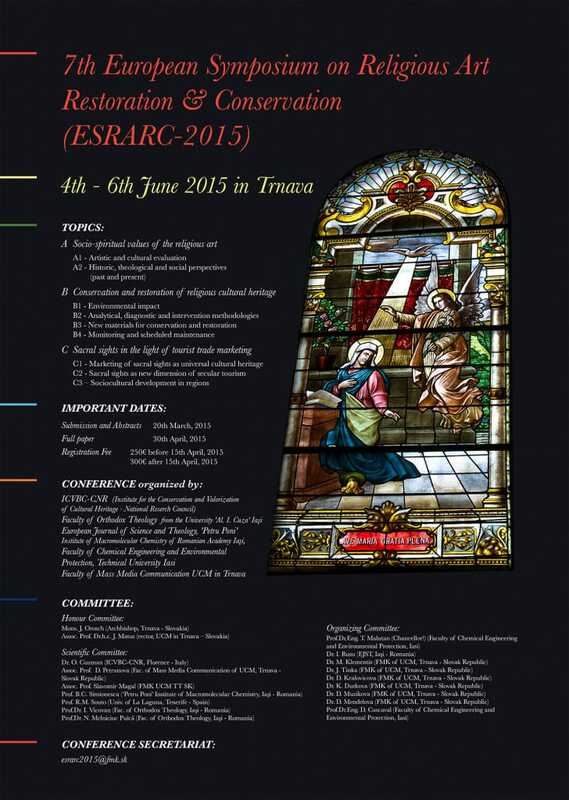 The manuscripts should be targeted to one of the topics of ESRARC 2015 conference. Language: Manuscripts should be written in British English. The manuscripts should have maximum 4 pages length, including illustrations (tables, figures, graphs).The illustrations should be included in the last page of the manuscript. Divide your manuscript into clearly defined and numbered sections. The authors should present their work using the below mentioned manuscript style. Please download and use the Template below when you prepare your manuscript. Taking into account the possible different type of manuscripts (technical or theoretical), the authors could choose between Operational goals or Materials and Methods, Results or Outcomes in order to present their work better. The figures, tables and graphs (maximum number of 4) should be placed at the end of the paper, each one on a separate page. The minimum resolution accepted should be 300 dpi and real dimensions of 10×13 cm. Each image, figure or table should be numbered in the same way as it appears in the text. The captions and numbers are placed below the figure, table or graph. Reduced fee for young researchers under 35 years old/doctoral students: 200 €. Conference fee includes as follows: rent of premises, conference materials, review process, book of papers publication, coffee breaks, raut, accompanying activities, guide services. The fee does not include lunch and accommodation. The registration fee must be paid by Bank Transfer. Please remember that 18th May is the payment deadline for the authors, who will be scheduled in the Conference Program. Regarding the note, please specify for „ESRARC2015″and write your name. All authors are in agreement about the content of the manuscript and its submission to the conference. The contents of the manuscript have been tacitly or explicitly approved by the responsible authorities where the research was carried out. The manuscript has not been published previously elsewhere, in part or in whole, in English or any other language. If the submission includes figures, tables, or large sections of text that have been published previously, the author is responsible for having the permission from the original copyright owner(s) to reproduce these items in the extended abstract prepared for the ESRARC-2015 Proceedings Book. Transfer of Copyright: By submitting the manuscript, the author agrees that the copyright for the manuscript is transferred to the publisher. It is well-known that Trnava originated at the crossroads of trade routes. It was created on a prehistoric road, passing the river Trnávka. The bridge was also built in these prehistoric times and passengers used a safe ford as well. Trinity Square is considered to be the space of prehistoric ford. Roads – the historical Internet. A man riding a good horse, which was tackled, was able to march 100 km per day. However, the moving speed of most people was 20 km per day. The fords, mountain passes, castles and ridges were considered to be very important focal points. The horses might have been tackled there. They might have relaxed there as well. 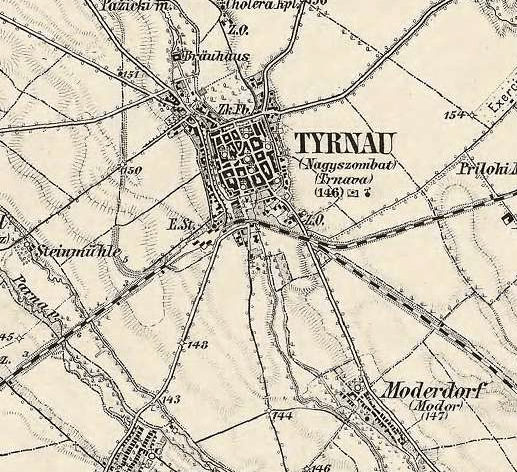 At the place, where some Czech and Považie roads were crossed, in the middle of Malé Karpaty on one side and Váh river bed on the other side, such a strong point as Trnava was created. Comparing to other then settlements, Trnava was more vulnerable. It could not take any protection of strong river into account, or any other unavailability resulting from the terrain. Building the wall work was the only one solution of town protection. This was not just any fortifications. Trnava represented one of the largest fortified towns in Central Europe in 14th century. Its area was 56 hectares and it was protected by a wall work, consisting of a continuous wall, interlaced by 32 gothic town towers. Prague was the only one out of then towns, having larger area. Original wooden palisade wall was replaced by some walled wall works even in the Middle Ages and some town walls were built among the towers later on. And what was the prize of wall works? Medieval castle consisted mainly of the tower, one housing building and wall works. That is the reason why Trnava was worth 32 castles for a king and Hungary at that time. Area of Trnava afforded an opportunity to take the largest country markets. This has attracted the visit of so many kings with its court. As the weapons were modernized, so the walls were as well. The original gothic spirelet was built-in and replaced by loopholes and pitch noses. The new ones, more effective weapons caused that the town walls were losing its defensive importance in 18th century and town wall space was sold to poor people without any arable land – called cotters by the town. The cotter houses were being built by the town walls, using the town wall masonry as a material for its side and front walls. What starts in the twenties of 19th century is a sad period of Trnava town walls. The upper and lower gate was torn down at that time. What a shame it was not preserved. The effort to save it hardly resists the arguments of some garden owners in the former town wall channel. The problem was that the town walls and town gates shadow their garden tomatoes. However, the maintenance of such a town wall range is very unique in Slovakia.